Refractive errors occur when abnormalities of the eye prevent the proper focus of light on the retina. 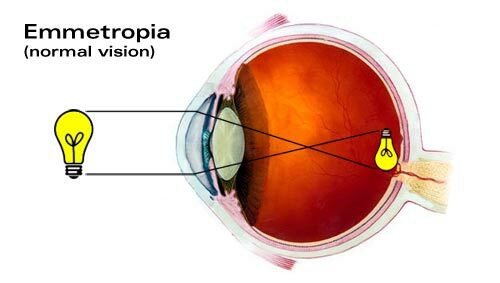 Emmetropia refers to an eye free of refractive errors. Two common types of refractive errors are myopia and hyperopia. Myopia, also known as near-sightedness, occurs if the eye is longer than normal or the curve of the cornea is too steep, causing light rays focus in front of the retina. Patients with myopia are able to see objects at near, but distant objects appear blurred. Clear vision can be restored to most myopes through the use of minus-powered lenses. 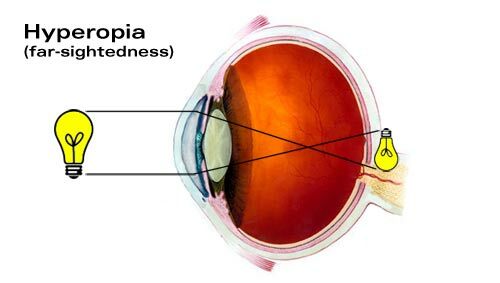 Hyperopia, also known as far-sightedness, occurs if the eye is too short or the curve of the cornea is too flat, causing light rays to focus behind the retina. Patients with hyperopia are able to see objects at distance, but near objects appear blurred. Mildly hyperopic patients may be able to see clearly at near without correction by using accommodation to compensate. Clear vision can be restored to most hyperopes through the use of plus-powered lenses. An even more common type of refractive error is astigmatism. 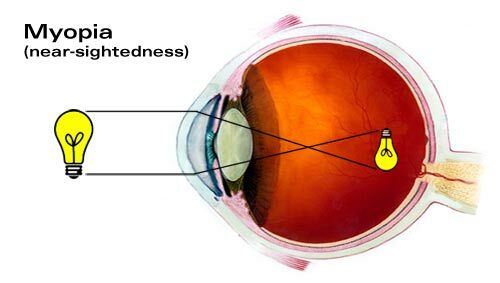 Astigmatism occurs when the cornea has an oblong, football-like shape in one or more directions (or axes) causing light rays to focus on more than one point on the retina. Astigmatism is compensated for using cylinder powered lenses along the appropriate axis. As eyes age, the crystalline lens begins to lose elasticity. With the loss of elasticity, the eye loses the ability to accommodate or focus at near. This typically becomes noticeable around 40 years of age. This condition where the crystalline lens is unable to add sufficient power to focus at near is known as presbyopia. The loss of elasticity in the crystalline lens continues until somewhere around the age of 65 when all the elasticity is gone from the lens as is all ability to accommodate. Presbyopia can be compensated for through the use of plus-powered lens segments, reading glasses, or magnifying devices.